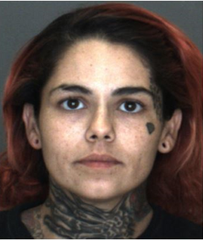 On Friday, November 2, 2018, Deputy Kevin Kraft located Lisha Marie Blakely on Gobar Road in Lucerne Valley. Blakely was arrested without incident for carjacking and a parole violation and booked at High Desert Detention Center. She is currently being held without bail on a parole hold. The Victor Valley Sheriff’s Station is asking for the public's assistance in locating Lisha Marie Blakely. Blakely is a 31-year-old transient known to frequent Lucerne Valley and Hesperia. The victim and Blakely met over social media and arranged a meeting. The victim picked Blakely up and drove her to the unincorporated area of Apple Valley. Blakely produced a handgun and made the victim exit the vehicle, then left the area in his vehicle. Deputies have located the vehicle but need the public’s assistance in locating the whereabouts of Blakely. Lisa Marie Blakely is a Hispanic female, 31 years-old, 4’11” tall, 160lbs, with brown hair and brown eyes. She has multiple tattoos, including a diamond on her upper left cheek. Blakely should be considered armed and dangerous, if you see her do not attempt to approach her, please contact law enforcement. Anyone with information regarding Blakely’s whereabouts is urged to contact Detective J. Grantham at Victor Valley Sheriff’s Station, (760) 552-6800. Persons wishing to remain anonymous can report information to WeTip by calling 1-800-78-CRIME, or by accessing the website at www.wetip.com.